The Kawaguchi Foreign Settlement (川口居留地) in Osaka with the Kizugawa River (木津川) and Kizugawabashi Bridge (木津川橋). The photographer shot this from the roof of the Prefectural Office on Enokojima (江之子島). 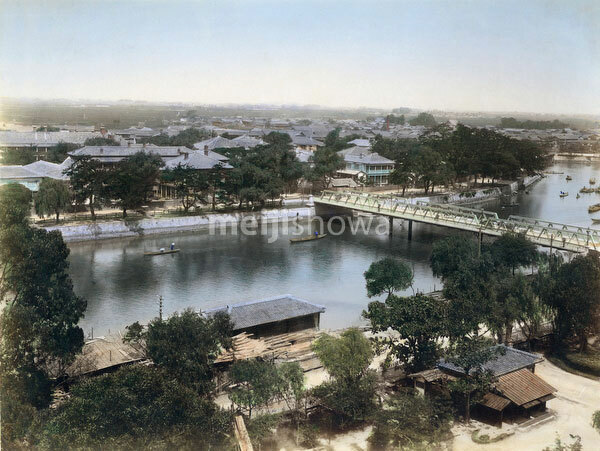 When Osaka became an open port in 1868 (Meiji 1) Kawaguchi was opened for foreign settlement, but it lost in popularity to nearby Kobe.